Apr 28, 2017 - We studied the effect of phenytoin on the release of copeptin, the C-terminal ... of syndrome of inappropriate antidiuretic hormone [arginine. Binding of arginine-vasopressin (AVP) to its V2 receptor (V2R) in the basolateral membrane of ..... with 1, 10, or 100 nM of the synthetic vasopressin analogue. 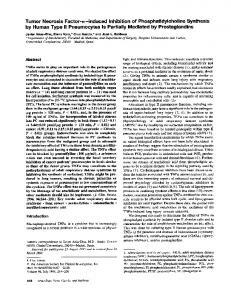 Inhibition of protein synthesis by streptogramins and related antibiotics. 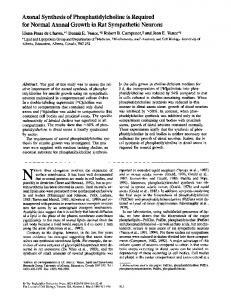 Journal of Antimicrobial Chemotherapy (1997) 39, Suppl. A, 7â13 ... 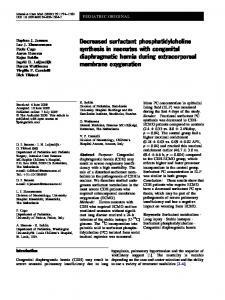 The streptogramins and related antibiotics (the lincosamides and macrolides) (MLS) are. Email: [email protected] Synthesis and ... purpose of manufacturing new drugs at the bulk level. Recently ... were recorded on LC-MS (API-4000) Mass. Jan 11, 2005 - Rockland (Gilbertsville, PA). Alexa Fluor 647 ..... Powell, D. W., Mifflin, R. C., Valentich, J. D., Crowe, S. E., Saada, J. I. & West,. A. B. (1999) Am. plated on glass coverslips, grown to 60to 80% confluency, and placed in basal ...... GTPase and complements IRA mutants of S. cerevisiae. Cell. 63:835-841. 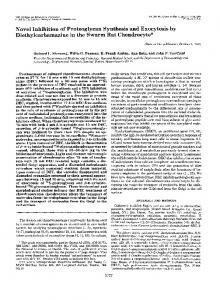 Journal of Antimicrobial Chemotherapy (1997) 39, Suppl. 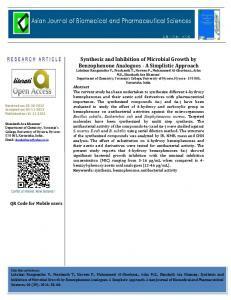 A, 7â13 ... action of the combined streptogramins against macrolide and lincosamide-resistant strains. Feb 14, 2002 - Although the pathway for synthesizing PC by use of Pcs is functional in P. ..... Recovery of strains after storage in glycerol at 70Â°C. Bacterial strains (PAO1 .... the inner and outer membranes of PAO1 (data not shown). FIG. 3. Wistar rats (250-300 g) as previously described (Castano et al., 1980). Isolated hepatocytes were incubated as follows. Cell suspension (1 ml; 3050mg wet wt./ml of suspension) was shaken (150 strokes/min) in stoppered 20 ml vials at 37°C in the presence of 10mM-glucose. The gas phase was 02/CO2 (19: 1). Measurement of [Me-3Hlcholine incorporation into phospholipids Hepatocytes were pre-incubated for 30min at 370C and at the end of this period 0.25,Ci of [Me-3Hlcholine was added. After 10min incubation, vasopressin, angiotensin, the cationophore A23187 or saline (0.9% NaCl solution) was added. At the time indicated the suspension of hepatocytes was poured into precooled centrifuge tubes and immediately centrifuged at lOOg for 20s. The supernatant was discarded and the pellet was extracted with 2.9 ml of methanol/chloroform/water (10:10:9), the aqueous phase treated three times with 2 ml of methanol/chloroform (1: 1, v/v) and the pooled organic phase dried under a stream of N2 at 220C. 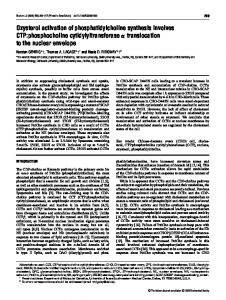 The measurement of the incorporation of radioactivity into phospholipids and their analysis by t.l.c. 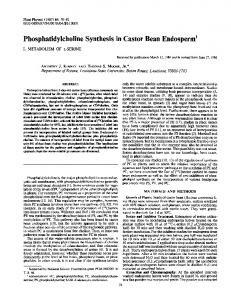 was carried out as described by Castano et al. (1980) and Garcia Gil et al. (1982). Isolation of microsomes Normally fed Wistar rats (250-300g) were killed by decapitation, the liver removed and homogenized with a Potter-Elvehjem apparatus in 4 vol. of ice-cold lOmM-Tris/HCl (pH 7.4)/0.3 M-sucrose. The homogenate was centrifuged at 125OOg for 20min at 40C and the supernatant was centrifuged again at 105 000g for 60min at 40C. The pellet of this last centrifugation, the microsomal fraction, was resuspended in an appropriate volume of 0.25 Msucrose (2.5-5.5mg of protein/ml) and used for the enzyme assay. 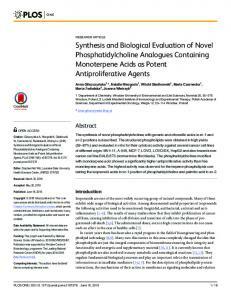 S. Alemany, I. Varela and J. M. Mato addition of the homogenate. 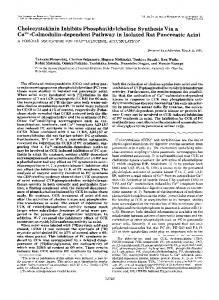 The measurement of the incorporation of radioactivity into phospholipids and their analysis by t.l.c. 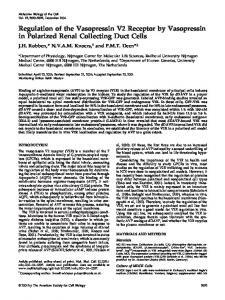 was carried out as described by Castano et al. (1980) and Garcia Gil et al. (1982). The enzyme activity was linear with time for at least 20min at all concentrations of substrate used. The concentration of protein was determined as described by Lowry et al. (1951). 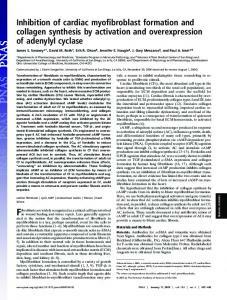 At zero time 5 pM-A23187 in dimethyl sulphoxide (0) or dimethyl sulphoxide alone (0) was added to a suspension of rat hepatocytes. Conditions are as described in the Materials and methods section. Results are means ± S.E.M. of three independent experiments in triplicate. 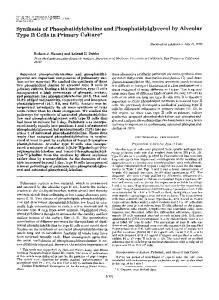 pholipids The incorporation of radioactivity into phospholipids was measured 4min after the addition of A23187. Results are means±S.E.M. of three independent experiments in triplicate. Fig. 4. Effect of different Ca2+ concentrations on CDP-choline:1,2-diacylglycerol cholinephosphotransferasefrom rat liver microsomes In the absence of added Ca2+ the activity was 1030±71pmol/min per mg of protein. Values are means + S.E.M. of three independent experiments in triplicate. 1/ICDP-Cholinel (#M-') Fig. 5: Double-reciprocal plot of CDP-choline:1,2-diacylglycerol cholinephosphotransferase activity Symbols: 0, control microsomes; *, microsomes treated with 10pM-Ca2+. Activities were assayed as described in the Materials and methods section. tifica, Insalud and Fundacion Rodriguez Pascual. 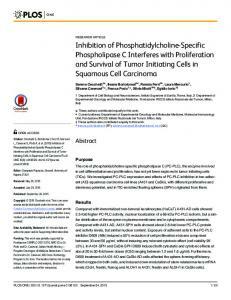 Report "Inhibition of phosphatidylcholine synthesis by vasopressin and ..."